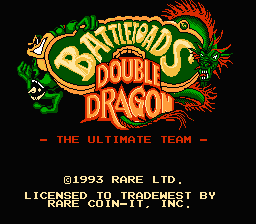 Battletoads & Double Dragon: The Ultimate Team is a crossover brawler from Rare that features your two favorite brawler franchises together for the first time. 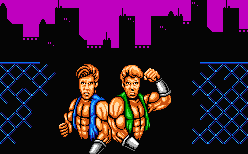 It plays a lot more like a 'Toads game than Double Dragon, with a strong emphasis on vehicle and platforming sections over combat. However, its difficulty is far more tame. RASH - I'm the crazy one and I'm super cool. My smash hits will leave 'em cold! ZITZ - I'm the smartest thing on webbed feet. I can think as well as fight! PIMPLE - I may not be smart, but when brain power fails, brute force prevails! BILLY LEE - I'm ready to rumble! 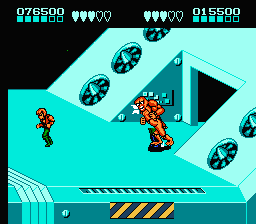 No-one can match my twisting typhoon kick! JIMMY LEE - If the going gets rough, I'm your man. I love a good fight! 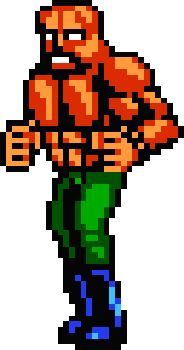 ABOBO - Abobo good at fight! You little jerks not stand chance against me! BIG BLAG - I'll be chompin' and stompin' if ya dare step inside the colossus! ROPER - Ropers the name shootin's my game. Come near me n' I'll blast ya ta bits! ROBO MANUS - Bzzt! You fleszhy foolsz will beg for mercy when fzzt I'm through with you! SHADOW BOSS - Come and get me if you dare, Dragons. I'll destroy you and those 'toads! THE DARK QUEEN - I'll soon rule your precious Earth battlejerks! Ha-ha-ha-ha! Looks like the Dark Queen's bruisin' for a rematch 'toads! She ain't taking any chances this time, not with the Shadow Boss for backup! Don't get in a flap, prof. We'll make it even, by teaming up with the Dragons! 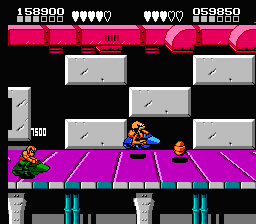 We're ready to rumble, toads. Pick us up at city hall, we can intercept the Ratship before it reaches Earth! 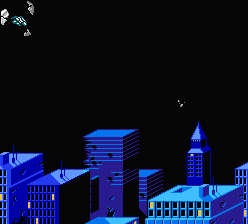 The Battlecopter swoops low over city hall and the Lee twins climb on board. 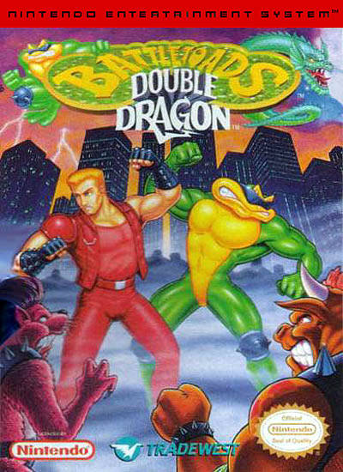 This game was made possible because TradeWest was the publisher for both the original Battletoads and Double Dragon games in North America. This version has a slightly longer story than the other ports which explains that the Dark Queen's spaceship came out of the moon. 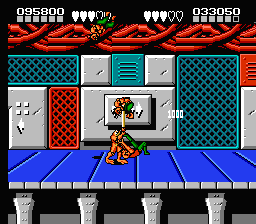 Battletoads & Double Dragon is an excellent follow-up to Battletoads that thankfully has a whole lot more brawlin'. Unfortunately, it's a lot shorter and easier than the original, although the presentation is about as good. The variety sections aren't quite as interesting or varied, either. 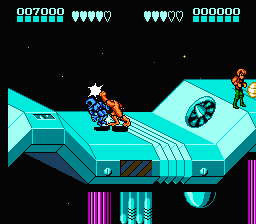 Still, this is one damn fine NES game. The OST is superb.